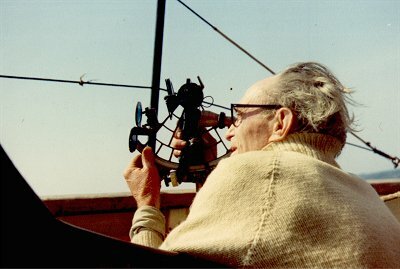 The idea of posting this account of the last successful Tilman voyage came after a remarkable chance meeting with Bob Comlay in 2001. I looked out my old Baroque file and found the notes and log from 1977, now almost 25 year old. I read my own words with fascination, as I typed them for publication on the web. 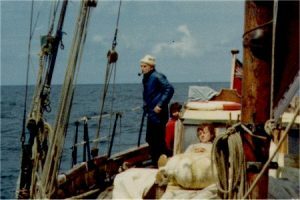 The diary tells of a rather poor start, low morale and genuine fears about the boat, I was only 21 at the time, and had never sailed a wooden boat before. As the diary continues the outlook improves, our main worry of how Baroque would handle a gale was answered just north of the Irish Sea, she simply lay a-hull and rode the waves, and actually leaked less than when she was under sail. My memories now of the trip are very different from those early fears narrated in the diary. 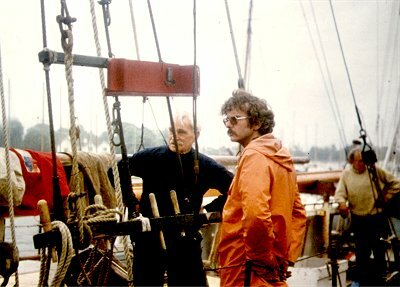 I feel immensely privileged to have met Tilman, and sailed with him, and more importantly, I learned a lot on that trip. 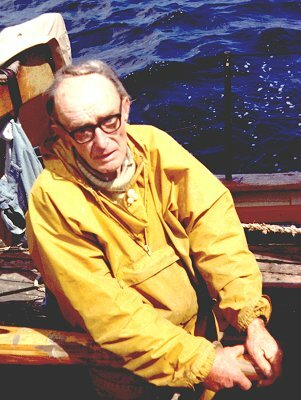 Tilman was a man who had a very different set of principles from most, he did not believe in artificial help of any kind, the challenge of a mountain peak or an ocean crossing was only worthwhile if it was one against the elements, what achievement is there if you take a helicopter to the top of a mountain, or get towed across the ocean? There are many references to the poor state of Baroque, both hull and rigging, and she was shot to bits. 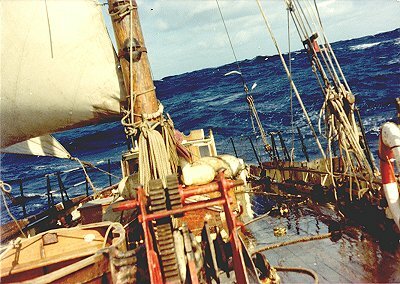 He knew how sea kindly she was in a gale, she was highly unlikely to fall apart en route, whatever my notes of the time may indicate (they were made before the first gale). The lack of gear was really only a concern to those who missed such things, as I, with many years racing experience, did. Tilman had never relied on ‘gadgets’ so the lack of them caused no concern, neither was much shown if something broke. The lack of speed, which seemingly infuriated me, left him untroubled, he took life as it was thrown at him, and found contentment in it. All of which leaves me with a conundrum. 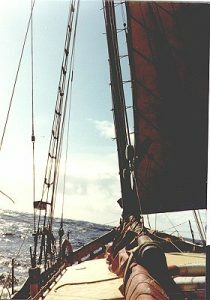 We proved that with a decent crew, and with some modern equipment we could sail an ageing pilot cutter efficiently and without serious mishap, and doubtless previous voyages, similarly equipped, would have found the same. And there’s the rub, what achievement is there with headlines like ‘Well found yacht reaches Greenland without incident, mountain climbed, all return safely’? Tilman is famous, and rightly so, for his amazing achievements, which he did with so little, and all the time I knew that as we got dispirited if some gadget failed, or a bit of the boat broke, he just smiled, he never needed them in the first place. 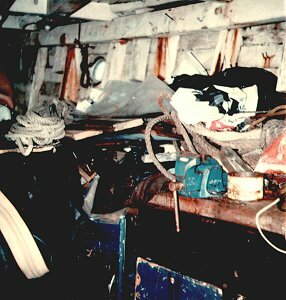 The saloon, looking aft. 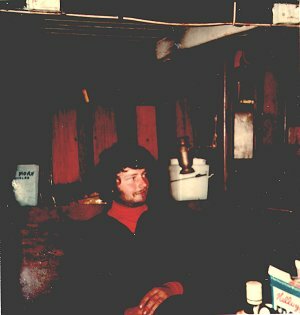 Under the table was a 100 gallon water tank, with the remains of the food and booze on top. Beyond the table and to the right is some impressive panelling with the engine directly behind. This made for very noisy and smelly meals. These panels gave access to the fan belt and generator and also to the main crankshaft pulley, which had a rather optimistic adaptation for a starting handle! Apart from the difficulties of access, the sheer size of the engine would have needed a gorilla to turn it over. Luckily, we never had cause to even think about hand starting. Above lies the only dry shelf in the boat, used wisely to hold a library of pilots, tide tables and light reading books. 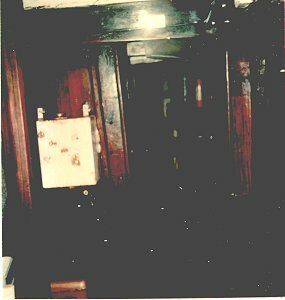 Much of the panelling seen is purely decorative and hindered efforts to inspect the hull for leaks or rot. The saloon roof detail, looking aft. 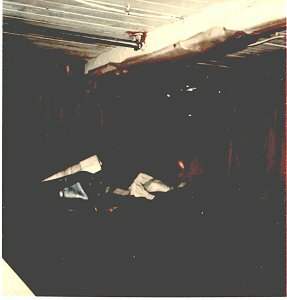 On the right of the picture is Frank’s bunk, the leeboard seen covered in plastic to protect Mike’s bunk below, the orange sheet and blue gutters form part of Frank’s water defences. The raised skylight was pained white. 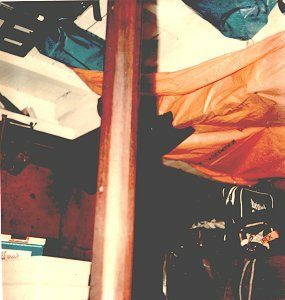 The lattice in the top left corner is part of the wooden fiddle, lowered on to the table whilst at sea. This was a lattice of wooden pieces which formed secure compartments for 4 plates, 4 mugs and the condiments. Nigel and his bunk. Note the impressive panelling, complete with red baize inlays, all taking up a tremendous amount of space and hiding rot. Also the plastic containers essential for storing anything from clean socks to spare batteries for the torches. 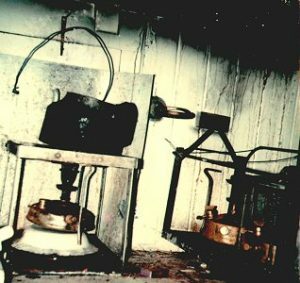 The oil lamp didn’t work and was one of the few remaining after vandals in Ireland had broken in and stolen most of them. Clearly visible at the top of the picture are two ends of the deck beams, cut to raise the saloon roof, seriously weakening the hull. From the companion way for’ad. 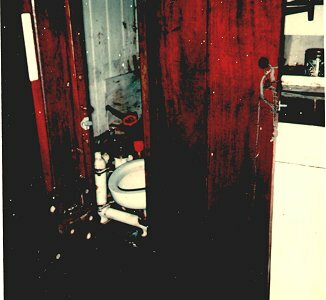 The stove and oil tank in the centre of the boat, with the companion way offset to Stbd. The view through the galley with the Skipper’s berth to starboard, followed by six huge food lockers which ran right through to the hull of the boat. Frank is filling his pipe in the distance. The Skipper’s berth. 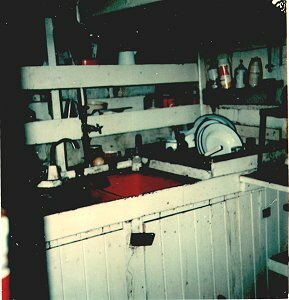 From the galley, showing the fine woodwork. The berth had dry drawers below and was naturally the driest berth, but still wet enough. The Galley. Showing the large sink, a household stainless steel affair, space was not a problem on Baroque. Nearly all the cooking utensils and plates are in sight! Note the mass of plumbing and useless household taps. The entire galley was sparkling white when we left Reykjavick. The Primus range. Only two of the Primus’ were gimballed, which lead to a contraption consisting of pieces of wire to hold both the Primus and saucepans together for the third one. The soup bowl under the Primus was the result of a gale where the Primus fell off the shelf and broke on of its legs. Note the amount of black soot from the paraffin. The heads. 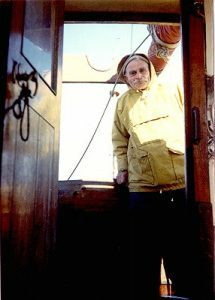 Owing to the ‘working’ of the boat the door no longer fitted the space designed for it and therefore had to be tied shut. As can be seen, the door opened directly into the galley! 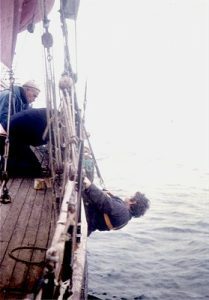 The trusty baby Blake was mounted half way up the frames about 4ft off the cabin sole and hence had a 12″ square block to rest ones feet on. The heads were blessed with a porthole which was frequently under water, which did at least give one something to look at. Generally, the heads were pretty nasty and more direct forms of relief were usually used. 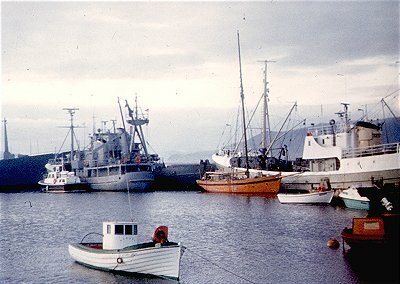 The forward berth. Looking astern to port. Showing the ladder for the fore hatch. Underway the plastic sheeting formed a complete cocoon and was 100% successful. The planking to the right of the picture is not the hull but flashing. The work bench. Looking for’rd. Showing the rusty hull fixings and frames. An enormous amount of useless gear was kept on board, including huge pieces of spare wood. To the left is the Avon rubber dinghy. The porthole in the picture leaked until firmly battened down, it took two nights to discover this. The forard berth – looking forard. Showing the ‘tool box’ in the form of an executive case to allow it to be called hand baggage although it weighted forty pounds! Also shown is the portable distress radio, most reassuring, and luckily, unused. 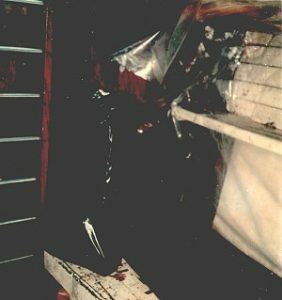 The curious bracket on the chain chute held two lee boards some 18″ high, quite necessary as there was a lot of movement up forad. To the right of the picture is the forepeak. In Lymington unloading the boat’s equipment. The Skipper is seen behind the back stay tackle. Drying the sails, we only had two cotton sails on board. The Genoa to the left of the picture and the trys’l to the centre. Just discernible is the splint on the gaff. 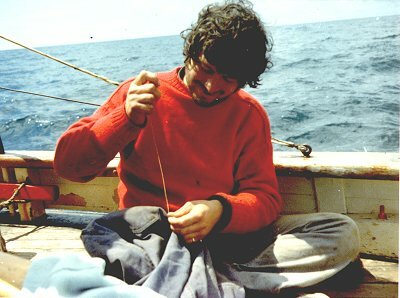 Unbending the VHF aerial cable from the topmast stay. The rigging from afar, note the radar reflector on the stbd cross trees. Baroque with the mains’l still bent. Baroque from forard. The anchor chain was made ready for the approach up the Solent. At sea all chain was sent below, the anchor lashed in board on chocks. Baroque showing Mike central, Nigel on the right and A N Other on land. Baroque. Early morning with ensign flying, special occasions only, though we did persuade the Skipper to fly it on and after the Silver Jubilee. Frank in the foreground. The Skipper and Mike against the guard rail. Baroque along side a fisheries ministry research vessel, who were most generous with coffee, showers and weather information, which all came courtesy of the BBC! 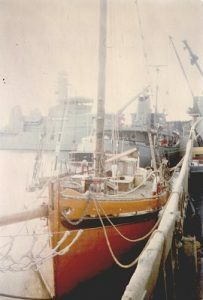 Astern is the Agier, just before her tiff with the Royal Navy during the cod war. Baroque, part rigged, notice the three steel bands round the lower section of the mast, holding an old scarf together. 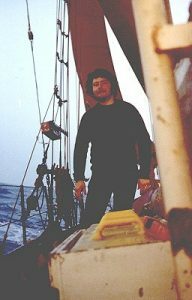 At sea, probably running under jib alone, Mike in the doghouse. Mike’s party piece! Applying a new tingle to try to stop the flow of water into the food locker, the light weather allowed us to continue sailing while ‘nurse’ applied the plaster. Nigel on deck, spare diesel and paraffin was kept in the yellow cans in the foreground. 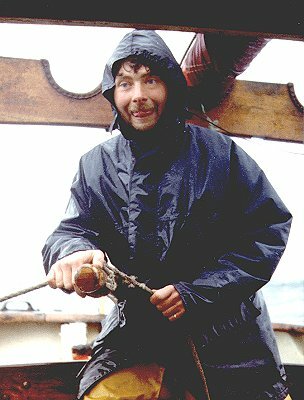 Nigel on the helm, having just tasted the skipper’s unique spaghetti a la sea water! Again, under trys’l and possibly jib. Frank checking that the boat is absolutely level before his perambulation on deck to take the fine sea air. Frank wondering why the tiller wont move towards him, while the other watch hand has obviously gone for a quick swim, leaving his clothes to dry. Cat Stevens creeps on board to do a bit of needlework. 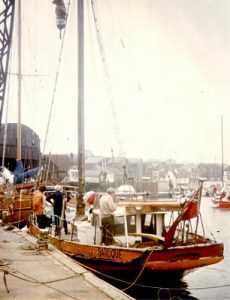 The old man himself, note the absence of the tiller lashing, which he steadfastly refused to rig, again, fine weather, but no mains’l, probably due to water intake. A masterpiece of box Brownie photography, must have been taken by Mike, as I am hard at work leaning on the dog house. The trys’l set, no hanks, just bits of rope, so it took ages to hoist and drop. The Skipper and Mike, Frank in the background. The Skipper is 79, it’s probably the last picture of him at the helm of his own boat before he died.